For the first time, holiday shopping online will surpass shopping in stores, according to ad Deloitte survey. And is it any wonder why? Pair instant gratification with not having to get dressed and battle other holiday shoppers — it's a winning combination. While you no longer have to leave the house to get the majority of your shopping done, there’s still some stress involved in staying within your budget during a season known for yo-yoing prices. To help you find the best deals on this season’s top gifts — without ever leaving the house, of course — take a look at our favorite holiday shopping tools. Keepa simplifies tracking Amazon product prices. Use the browser extension or app to access price history graphs, price drop alerts and availability alerts, compare Amazon prices, or import a wish list. Set notifications via email, Facebook or Twitter. On the downside, Keepa doesn't work with some products due to marketing regulations or with e-books with fluctuating data information. Another bummer: Keepa is only available as a paid Android app. If you want the free version, stick with the Chrome or Firefox browser add-on. To use Keepa in your browser, just install the extension and start shopping on Amazon. Then click on an item and scroll down to its description to access Keepa’s features. There are no pesky popups or desktop alerts to deal with here. Bottom line: If you’re a fan of Amazon’s CamelCamelCamel, then take a look at Keepa for Android, Chrome and Firefox. Slice snoops through your emails to find and store e-receipts and then tracks the progress of your purchases along the way. If your purchase has shipped, is out for delivery or has dropped in price, Slice will give you the heads up. It’ll even draft an email for you to help you earn a refund if the price of an item dropped. The app can help you become a more conscientious consumer by alerting you to your spending habits at various retailers. It also sends alerts if one of your purchases has been recalled by the Consumer Product Safety Commission. Not only will you save money, but Slice helps you address personal spending habits and prevent mishaps with a dangerous product. Get Slice for Android or iOS. Windfall is a fledgling rebate app with a lot of promise. Just shop at a retailer like you normally would, then scan your receipt into the Windfall app. Windfall catalogs and digitizes them using optical character recognition technology (like what’s used in Adobe Acrobat Pro to make text editable or in smart desktop scanners to convert scans to typed content). If Windfall finds a lower price on the items on your receipt, either at the store or online, you’ll receive a notification. Then head back to the store to claim your eligible refund. There’s some legwork involved, but Windfall follows each retailer’s price-matching guidelines, making it worthwhile to head to the customer service line for a guaranteed refund. To date, Windfall is compatible with Amazon, Babies R Us, Best Buy, Lowe’s, Office Depot, OfficeMax, Staples, Target, The Home Depot, Toys R Us and Walmart.) While the app is just getting started, keep this one on your radar for when you shop at major retailers in stores and online. Try Windfall for Android and iOS. Coupon Sherpa digitally clips coupons not only from major retailers but restaurants as well. After spending all morning power shopping at the mall, you can rest your feet at a nearby restaurant that's also offering great deals. To find discounts, sort through coupons by categories like clothing, department stores or electronics. Use your device’s geolocation tool to locate deals in your area, or save your favorite stores and track their latest coupons. Then just display the code at the retailer’s checkout counter to save. If you’re shopping online, Coupon Sherpa also allows you to redeem codes online directly from the app. Get Coupon Sherpa for iOS or Android. Flipp helps you say goodbye to that thick wad of Sunday circulars by cramming them all into its app — more than 800 offers, to be exact. If you prefer not to browse by store, type in an item or brand to see if there’s a deal, and tap an item or deal in a circular to clip it for easy access later. To save time once you hit the store, build a checkable shopping list within the app, which will auto-populate related coupons you can clip. Flipp uses geolocation to display nearby retailers and can even send you push notifications to remind you if a deal you’ve saved is expiring soon. If your mobile device isn’t in reach, review all your circulars directly on Flipp’s website. 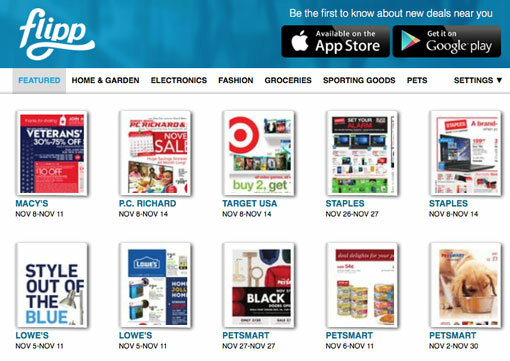 Then click on a coupon to be redirected directly to the retailer’s coupon for online redemption. Try Flipp for Android or iOS. Honey lets you leave behind the scissors and sales fliers and join the digital age. Just download the browser extension, and that’s it. Honey will automatically appear in the right side of your browser if it identifies discount codes and e-coupons on your retailer site. Then just select Try Codes, and Honey will automatically test out the codes, saving you the trouble of hitting CTRL/COMMAND + C and CTRL/COMMAND + V repeatedly. Currently, Honey is compatible with more than 3,000 retailers and 12,000 merchants, so if there’s a discount out there, Honey will find it. HoneyGold is a reward program that works across different retailers, like two reward points for every $1 spent at JCPenney and one for every $1 spent at Target. You can redeem the HoneyGold rewards for cash, gift cards or even real gold, Honey says, but I haven’t maxed out my credit cards enough to qualify yet. Honey is available for Chrome, Firefox, Opera or Safari. I buy a lot on Newegg.com and use the ‘Hover Hound’ browser plug in which compares current prices against Amazon and Tigerdirect without having to copy/paste or switch sites. It also tracks an items history so you can see the price fluctuations over the past few months. It’s a nice tool. Great round-up, thanks very much and happy holidays! Nice list but probably time to update it. You’re missing RankTracer’s HOURLY price tracker that can pick up short-lived (i.e. an hour or two) huge discounts that others sites miss completely. It’s also got charts and tables to compare products by sales performance, reviews and current and historical prices. As well as coupons to help shoppers squeeze more savings out of Amazon.